"The woman whose boyfriend died when they were stranded for six days in the Sierra survived by eating tomatoes and snow and taking shelter in a hollowed-out tree, according to a doctor treating her at a Carson City, Nev., hospital.... Lane and her boyfriend, Roderick Clifton, 44, became stranded on Nov. 29 while traveling from his home in the Sacramento suburb of Citrus Heights to her home in Gardnerville, Nev.
"Along the way, Clifton decided to test the four-wheel drive capability of his Jeep Cherokee and drove around a locked gate on a closed dirt road, Alpine County sheriff's officials said. "After traveling several miles, the vehicle got stuck in the mud and the two couldn't get it free, officials said. Clifton left the vehicle the next morning to get help. When he did not return after a couple of days, Lane left the Jeep as well. On her trek to safety, she came across his body. " I will be accused of being insensitive here, but the truth -- like reality -- is sometimes harsh. This article is about being prepared, thinking ahead, realizing that every action has consequences and, most of all the stark, unyielding reality: "The wilderness is wild. It will kill you if you aren’t trail smart." I wrote that in a piece for my author's blog before I started Tactical Trekker. That piece is all too relevant to this case. If you ignore the issue of driving around a locked gate, you still have the reality that you need to be prepared for the Darwinian certainty that if you screw up, Mother Nature may kill you. Yeah, Mother Nature is highly insensitive to human concerns. That's how evolution happens. Now, if you go off road, you must assume you will get stuck. That means you need a winch, a hefty tractor-sized jack, a shovel or two at the least. And you need to know how to use them. And, if you don't come equipped, you can just have a bad experience rather than a fatal one if you have OnStar or either person had been carrying a Spot personal satellite tracker. Yes, you can get OnStar add-ons for any vehicle. And it works via GPS where there's no cell signal. Spot is the size of a fat iPhone, costs about $100 to start and $50/year, tracks your GPS coordinates and can summon help when you really need it. The photo, above, is my battered and scraped-up four-year-old Spot that I carry with me backpacking. I've taped over the emergency buttons so I don't push them by accident. I'm often out in Sierra wilderness areas by myself. 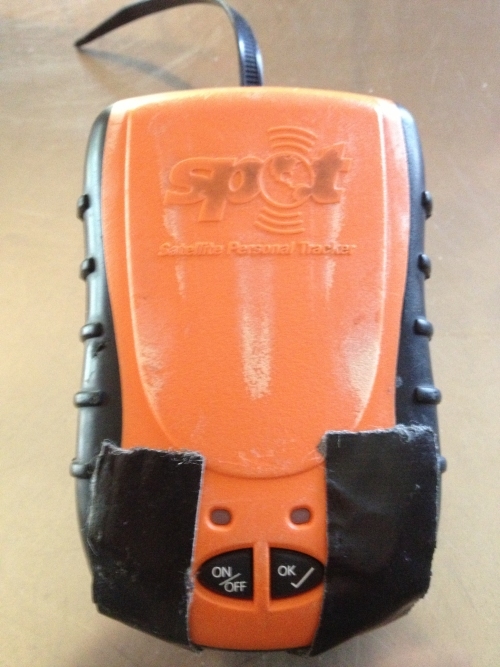 At best, Spot can summon emergency help. At worst, the search for my body won't be long and involved. Usually Spot just sends a period message tracking my position ... that goes to my wife and family via email and text messages that indicate I'm alive and moving. In this particular case, having Spot or OnStar, would have meant that a woman didn't have to eat tomatoes, snow and huddle in a hollow tree, and a decent -- but naive and unprepared guy -- gets to live and learn from a serious mistake.